Nick van Woert, Lady Lady, 2011. Fiberglass statue, polyurethane, 44 x 72 x 24 in. Art has been heading heavenward in recent months. Summer Guthery's Chrysler Series has been bringing an array of events and ephemeral exhibitions to the 31st floor of the Chrysler Building, and the Dependent Art Fair (more on it later) staged a one-night blowout on the 12th and 14th floors of the Four Points by Sheraton hotel in Chelsea on Friday. 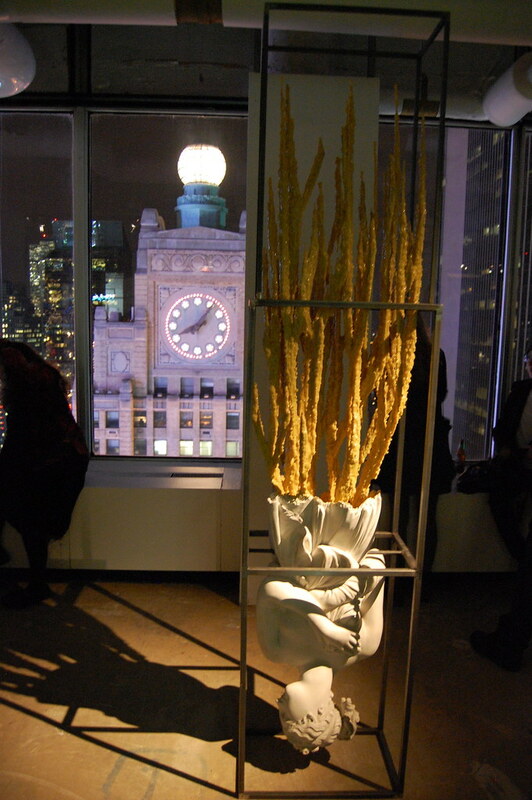 On Monday night, the 33rd floor of 1500 Broadway was the site of another above-ground exhibition, arranged by billionaire London–based collectors Anita and Poju Zabludowicz, whose Tamares investment group owns the building. The space is almost completely unfinished, sporting raw cement floors and ceilings lined with unconcealed pipes. Block out the breathtaking views of New York City (though that is pretty much impossible given the enormous windows), and you might think you're in a new space far out in Brooklyn, at least until you spot the four very shiny Nick van Woert sculptures, two of them dated 2011, which are included in "The Shape We're In (New York)," an exhibition of work culled from the Zabludowicz's collection. They're joined by seven flashy Ethan Breckenridge pieces — or eight, if you count the coffee-vending-machine-and-sound piece that he made with Sean Dack, titled My Thoughts on Your Thoughts (Fifteen, Fifteen, and Thirty for Lunch) (2010). 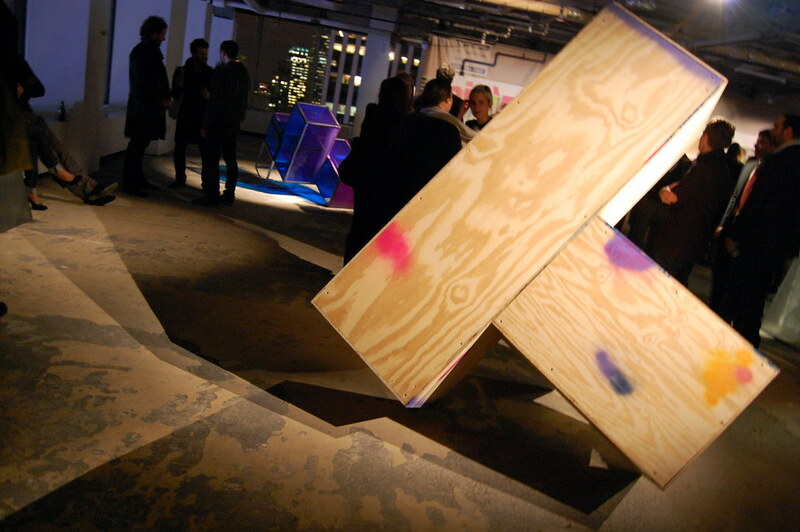 The three Sarah Braman sculptures — sets of cubes in various materials combined into three-dimensional Tetris blocks — work best here, their empty boxes balancing precariously in a temporary gallery that is, it may be worth remembering, vacant, unused real estate. Front: Sarah Braman, Ghost Sculpture (Coffin), 2010. Plywood, lumber and paint, 79 x 66 x 58 in. Back: Sarah Braman, October Animal, 2010. Metal, Plexiglas, paint, 48 x 66 x 58 in. 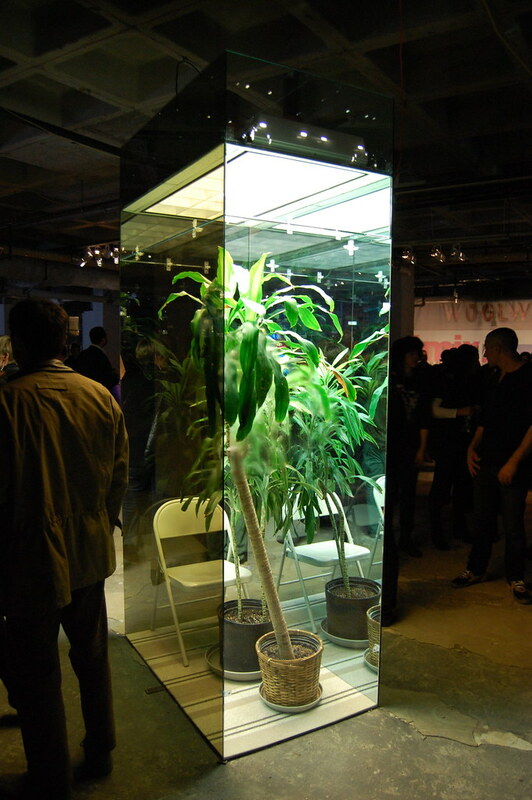 Ethan Breckenridge, Plants Have No Back, 2008. Mixed media, 39 x 51 x 105.75 in. Independent curator Alex Gartenfeld has also staged a show in the space. Titled "Proposal for a Floor," it is as quiet as a whisper, contrasting radically with the other show. Anselm Reyle delivers the most aggressive touch, an untitled 2009 neon sculpture that is a tidier, dissembled version of a Keith Sonnier. Dominic Nurre's contribution is subtler, two leather chairs bearing large salt licks that look perfectly surreal in this cubicle- and desk-less office. Rounding out the bunch are Josh Tonsfeldt, Kon Trubkovich, Jim Richards, Sam Anderson, and a personal favorite, Michael E. Smith, who presents two of his reworked milk jugs. The space is open only by appointment after today. After April 15, its shows will close. 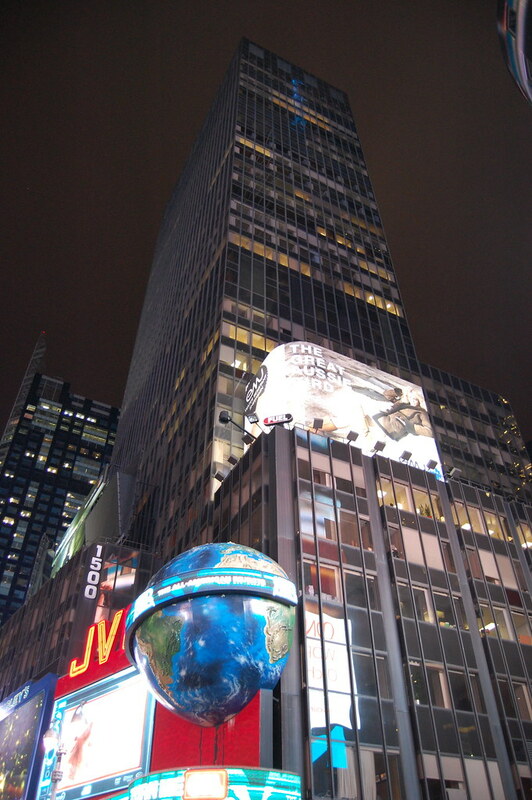 Max Neuhaus's Times Square (1977) sound piece, however, will remain in the area, humming away on the island between 45th and 46th Streets on Broadway, just as it has since it was reinstalled by Dia in 2002. It provides a stolid, permanent counterpoint to the fast action of the past week. If you have a spare moment, visit it after you descend the elevator of 1500 Broadway. 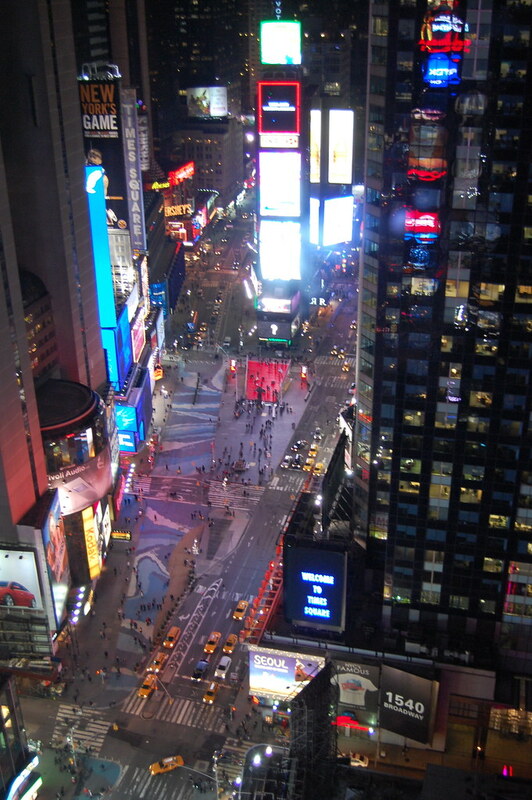 The view from the 33rd floor of 1500 Broadway, looking north. Modern day jacksonville epoxy flooring is something but grey. If you're considering that unlovely and unloved rough texture you discover in without treatment car port flooring and car parks then you're in for a gorgeous delight.